Marcie Howard would like to build an “accessory dwelling unit” right about here. 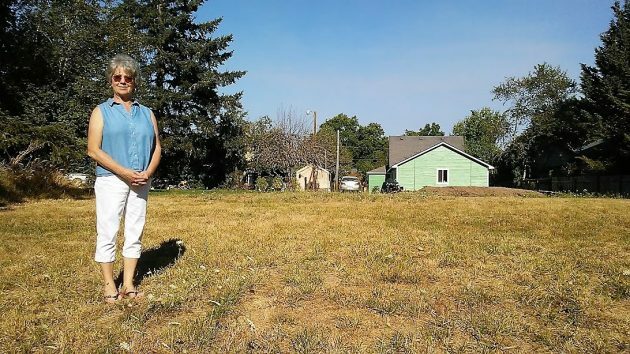 When you see the spot where Marcie Howard and her husband, Gary, would like to build a small house on the property of their son, it’s hard to see why the city of Albany and Mayor Sharon Konopa won’t let them. The Howards moved to Albany last fall from the north Oregon coast after Gary, 76, had major surgeries close together and was suffering from the effects. They hoped to build a place behind the house of their son, Douglas Howard, on his 1.7-acre property between Broadway Street and the Calapooia River floodplain. But even though the 2017 legislature required cities to allow “accessory dwelling units” including detached ones, the Howards have been stymied so far by Albany’s development regulations and, most recently, by Mayor Sharon Konopa’s veto of a change in the development code. As it is, the code bans detached units and limits attached ones to 750 square feet. The council voted 4-2 for an amendment to allow detached units and raise the maximum size to 900 square feet. But the mayor vetoed the change, and the 4-2 vote was one vote short of overriding it. Which leaves the Howards where they were before — renting a house on Ninth Avenue and unable to proceed. More than once, Marcie Howard has appeared before the city council, most recently last Wednesday, to describe her family’s situation. Friday I met her at her son’s place to see for myself. Konopa says she worries about accessory units clogging streets with parked cars and turning single-family neighborhoods into apartment zones. But on the Howard property on Broadway, there’s plenty of room for off-street parking. And just one or two houses away, a series of apartments has existed for many years. Marcie and her husband could put a “hardship dwelling,” a manufactured home, on the property with a doctor’s certificate. But that would require the neighboring owners’ permission, which could be revoked by any one of them every two years. And when the medical hardship ends the home would have to be removed. So if one spouse dies, the other would be left homeless and the son would be stuck with getting rid of the home. So now what? The mayor, still recovering at home from a car crash, has said she wants to work on a new version of development code amendments on accessory dwellings. No word on the timing. Marcie Howard and her son, Douglas Howard, in front of Doug’s house on Friday. It does add dramatic effect to your prose, however. An excellent blog post…thank you for pointing this actual example out. Too often our administrative state limits property rights in the abstract without thinking about how this hurts people who actually want to use their property. I wouldn’t be surprised to find that Sharon Konopa would like low income people to have quality housing—but she’s part of the reason that sort of housing isn’t available. I can see both sides of this one. Neighborhoods over crammed with cars does lower the quality of life and the property value… – people being people – there’s always somebody looking for exemption – but it does appear as though these folks have both a good reason and ample space on the property to park their own cars… Maybe if the neighbors sign a petition agreeing to let them proceed… Glad I don’t have to make the call. I could not find the ordinance to read it. The question is when does the veto take effect?? If it was not an emergency to Charter says it takes effect 30 days after the final vote of the Council trying to overturn her veto. Not sure what you are talking about here. There is no ordinance to take effect. The ordinance making the code changes that would help this family passed the council but was vetoed and the veto was upheld. That leaves existing city law unchanged. Why is this so difficult for Albany? The state has stated their intentions. They even published guidance and model code wording for Albany to use. Also, the publication is crystal clear that Albany should not include off-street parking requirements in the development code. The spirit of the law is pretty clear – create more housing by removing barriers to development. So who is the barrier in Albany? The Mayor, Olsen, and Coburn? Or the four councilors who approved revised code language that the Mayor vetoed? Then blames others for preventing progress. Vote ’em out! Vote ’em out! That’s the closest you’ll ever hear me sounding like a Trumpite! We need a new mayor and a new council. The same city is allowing a Starbucks and a dental office be built on a much smaller lot on one of Albany’s busiest corners as we type. Way too much individual power in our government. True, and Albany citizens can reclaim that power through the Initiative and Referendum Procedures in the Municipal Code. Several years ago we did this and changed the City Charter to give voters the final say over future urban renewal plans and debt. It can be done. In this case, the charter gives the Mayor the power to veto what a majority (4) of councilors want. Perhaps this individual power should be completely removed, or allow the majority to decide like Chapter III, Sec. 20 provides. It really is quite simple. Who do you trust? The mayor/council or Cordier/Shadle. Everyone has an agenda. It really depends on which one you support. Konopa & Olsen, the reason Albany does not have a Gatorade plant and all of the jovs that would have come with it. Does anyone see the need for change yet? That’s not so. Those two had nothing to do with Pepsi canceling its plans in Albany. They could try to subdivide the property with additional lots and build any size house they want. Requiring additional off street parking was mentioned in new state law but maybe we could require that housing over 1 bedroom require off street parking. That is not proposed from the state but might work for us. Parking can be a real problem in some neighborhoods and we shouldn’t create a worse problem. The new zoning on the waterfront area etc. wanted no required off street parking but changed it to be required if over 2 bedrooms. The state is asking us to allow up to 900 sq. ft. which was being proposed. Lot coverage will make it not available in some places. RS 10 lot coverage is 50%, RS 6.50and RS 5 is 60 %. So there may not be enough room to have a accessory building in some areas if the house already covers 50 or 60 % of their lot unless the accessory is an inside structure. I have a large lot and basement and could have 2 structures plus one in basement but we are only allowing one which is fine with me. CARA could find a restoration of that old downtown hotel, turning it into a sort of shelter for all the grannies who cannot have their shack-out-back thanks to Mayor Konopa. There seems to be many available rooms in the upper reaches and the location is near most essential government services the elderly often require. The savings in fuel and green house gasses alone would make this viable and give the Mayor/Council an easy out.